Though we have played a role in creating it, the intelligence we would be faced with would be completely alien. It would not be a human's mind, with its experiences, emotions and logic, or lack thereof. We could not anticipate what ASI would do because we simply do not "think" like it would. In fact, we've already arrived at the alarming point where we do not understand what the machines we've created do. Hardly a day goes by where we're not reminded about how robots are taking our jobs and hollowing out the middle class. The worry is so acute that economists are busy devising new social contracts to cope with a potentially enormous class of obsolete humans. Documentarian James Barrat, author of Our Final Invention: Artificial Intelligence and the End of the Human Era, is worried about robots too. Only he's not worried about them taking our jobs. He's worried about them exterminating the human race. 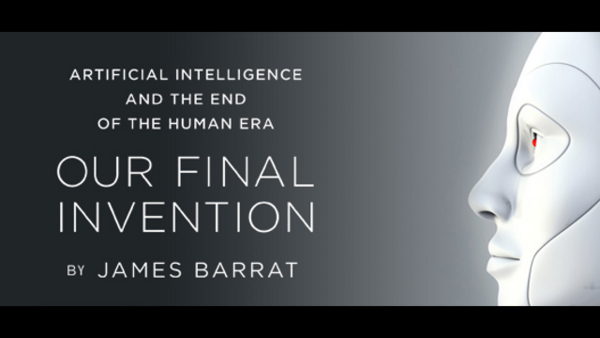 I'll repeat that: In 267 brisk pages, Barrat lays out just how the artificial intelligence (AI) that companies like Google and governments like our own are racing to perfect could -- indeed, likely will -- advance to the point where it will literally destroy all human life on Earth. Not put it out of work. Not meld with it in a utopian fusion. Destroy it.